I have known Katie Smith since I was a little girl. If I have learned anything about her it is her obsession with dogs. Not even cute dogs (besides Reggie). The ones that a bystander would most likely walk past without a glance. The tick infested, flea hoppin, nappy dread lock kind, any normal human would steer clear of. My point about her obsession, is that it is her passion. A rare passion, that takes a particular set of eyes to foresee potential. These eyes are Katie Smiths. Our very last day in Bimini, we laid low. We spent the day organizing, resting, and enjoying our surroundings bittersweetly. The following day we would be leaving before sunrise, to cross the Gulf Stream back to the States. A trip I can claim we were both nervous about. 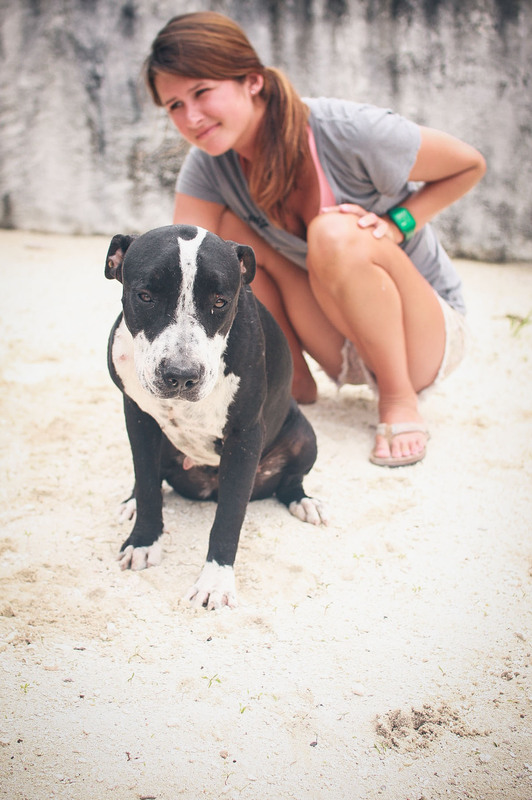 On Sunday afternoon, Katie gets introduced to another woman named Katie, who is involved with the stray dogs of Bimini. Uh oh. Within in an hour Katie informs me that she is a fostering a stray dog, and we will be transporting it to America. Biting my tongue, to keep myself from speaking how I really felt the idea (which was no idea at all, it was a fact) I half heartily smiled with reluctance. I immediately had visions of an unfamiliar dog, sea-sick in rough waters, crap & piss all over Louise, barking and whining itself to death. One more variable to possibly ruin our last day of traveling. You see, this is where my brain goes when I think of fostering a stray dog in the Bahamas. Meanwhile, Katie is thrilled. She’s not worried about a thing This is Black Dog. Her name is really Oreo. We didn’t like that name. After psychoanalyzing, and spending some time with her we learned that she had very little personality. She was scared, lost, confused, a sweetheart really, and didn’t know what to do with herself. Poor thing. She was just a Black Dog. Black Dog lived with Bronco, in the back yard of a random Bimini home. Bronco was not only Black Dogs father, but also the possible father of her puppies. Weird things happen on small islands. They were fenced in, but no one necessarily looked after them properly. Locals Katie and Grant, who are involved with the stray dogs, played a role in keeping these two alive. Black Dog is a 1 1/2 year old pit bull. Her flea population was comparable to the population of China. Her tick population comparable to that of Bimini, not much over 1000. I was scared to get close enough to photograph this, so I didn’t. Katie and these two superstars spent hours removing Black Dogs Ticks. A process I opted out of. She said there were at least two or three hundred ticks on each ear. It turned out Katie and Grant had a friend Kathy who is a pilot. Kathy flies back and forth to Fort Lauderdale, and offered to fly Black Dog to the states the next day. This way, we would not have to put her on a boat for the first time in her life, only to cross the Gulf Stream which is known to be one of the more dangerous crossings for cruisers. 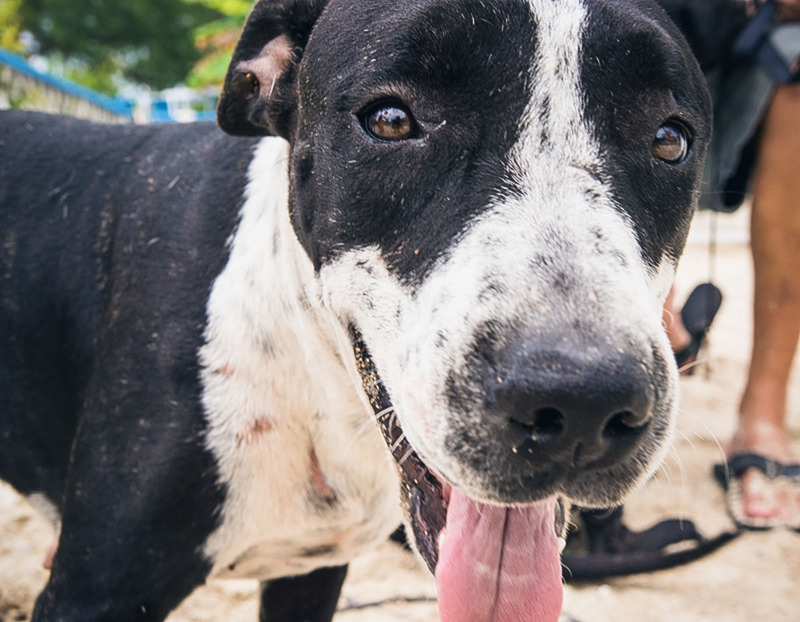 A fundraiser for the strays of Bimini, Island Paws, and a couple generous pitty lovers helped cover Black Dogs vet bills, when we returned to the States. She was all cleaned up & healthy within a week when, a couple named Jenny and Bob provided Black Dog with a loving home in Fort Lauderdale. 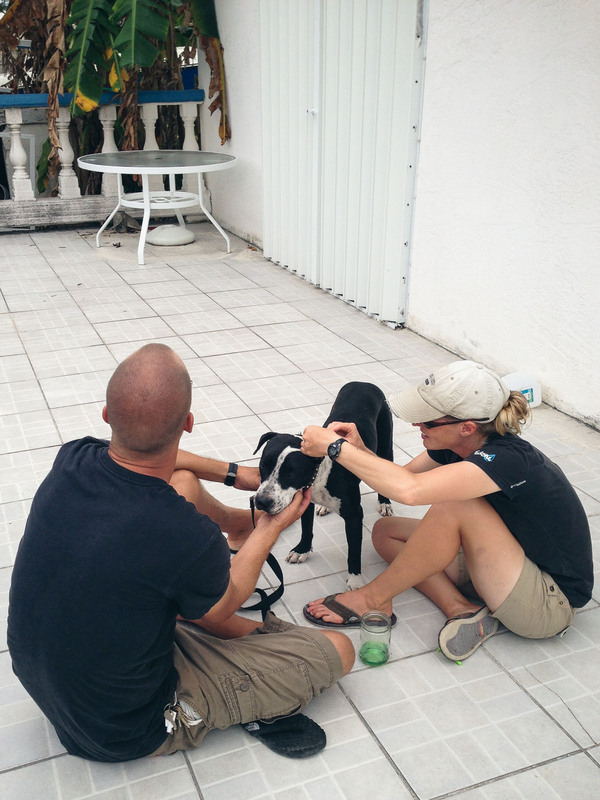 Jenny and Bob had met Black Dog in Bimini before, and were aware of the fact that Katie had taken the initiative to foster her, with means to find her a family. By the time we had to say goodbye to Black Dog, even I was a little sad to see her go. Katie went above and beyond to save this one. The amount of time, and organizing she put into making this happen in such little time, was truly impressive. When we were little girls, Katie nick-named me Brave. After this event, she gets the title, not me. Katie Brave. If you are interested in fostering a Bimini dog, there are so many amazing pups running around the Islands that need a family. Check out https://www.facebook.com/pages/The-Stray-Dogs-of-Bimini/128258473969736 to learn more!!!! Maybe Katie “Big Heart” would be a beter name. Nice going. Aw! 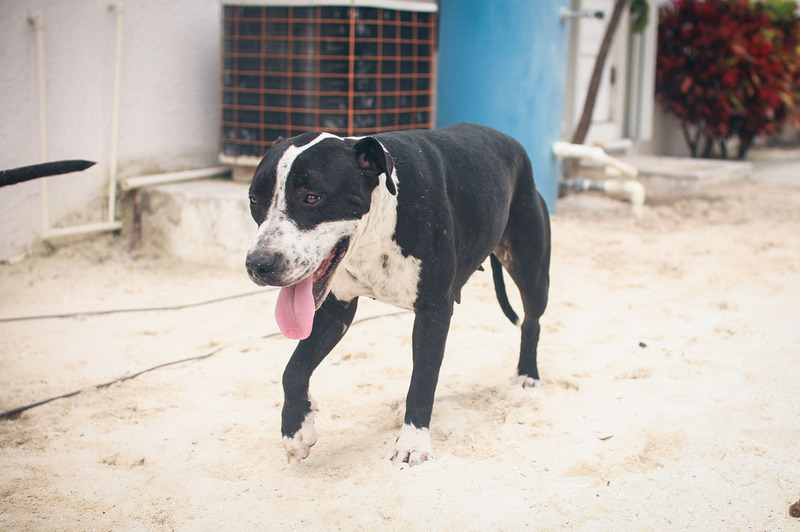 I’m glad to know there’s one less stray/neglected dog in the Bahamas, and really glad to hear Black Dog has found a forever home! Interesting that you write about dogs. When I was cruising around the Caribbean there were so many stray (?) dogs and I thought that a photo book about them would be interesting: Dogs of The Caribbean. When and if you get there… you’ll see what I mean.